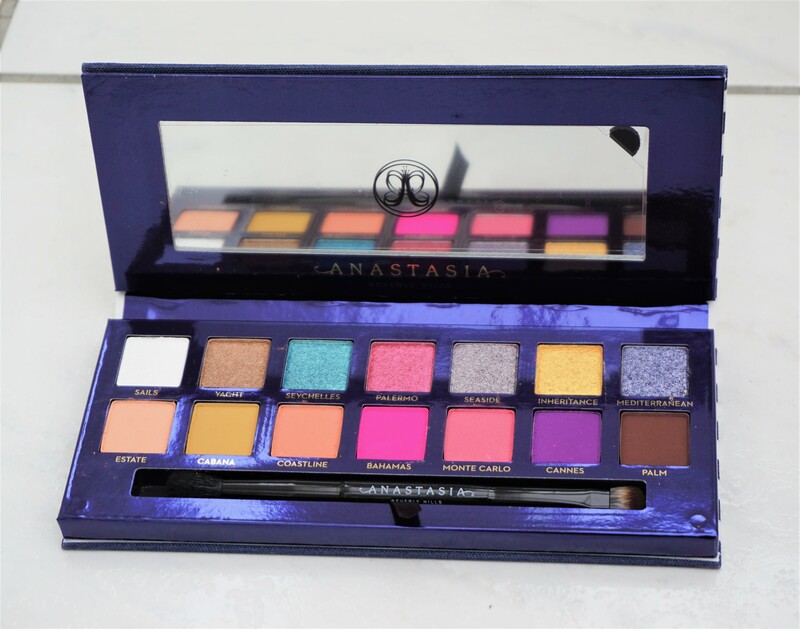 The official Anastasia Beverly Hills website states that the palette will enable you to “Set sail with 14 ALL-NEW paradise-inspired mattes and metallics, from vibrant jewel tones to bright pops of colour”. 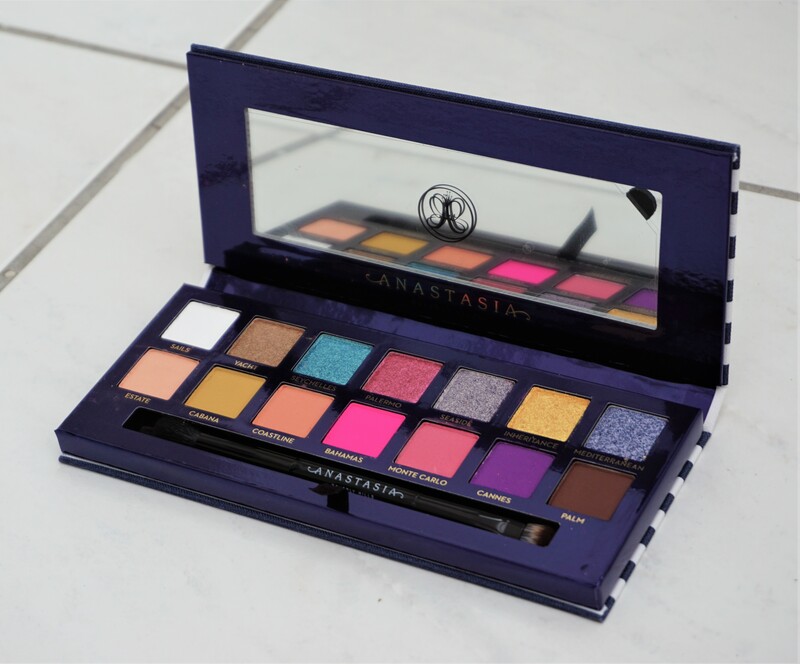 The website also states that the “Anastasia Beverly Hills Riviera Palette is an essential springtime colour collection featuring classic neutrals and seasonal tones that are perfect for creating your ultimate vacation looks”. The website provides a breakdown of the shades contained in the palette, including shade names and descriptions. 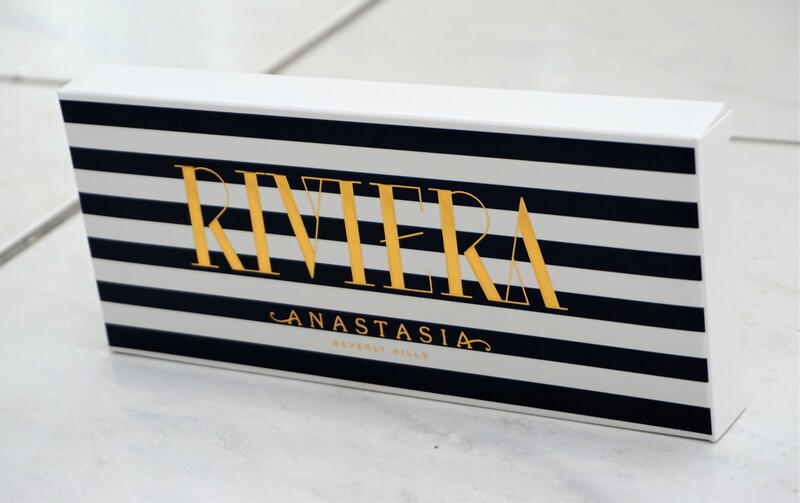 The Riviera Palette comes packaged in a sleek, rectangular white and navy striped box. The front of the box has the palette name and brand name inscribed in chrome-like gold lettering. I think that the colour scheme really reflects the whole nautical, riviera chic style concept behind the palette. The back of the box has a snapshot of the palette contents, with eyeshadow colours, layout, names and the brush. The box states that each eyeshadow has a net weight of 0.73g/0.025oz. The ingredients list and distribution information are also printed on the box. The box says “Set sail with 14 all-new paradise inspired mattes and metallics, from vibrant jewel tones to bright pops of colour”. The box has a warning at the bottom stating that “Bahamas, Palm and Cannes are not intended for use around the immediate eye area”. These particular shades are described as ‘pressed pigments’ on the box and their formulation is slightly different from the other shades in the palette. The eyeshadows, pressed pigments and brush have all been formulated in the USA, making the contents subject to FDA regulations. My understanding is that particular shades, finishes and types of eyeshadow which are cruelty free may use ingredients which may react variably on people’s skin. The main aspects surrounding the warning (from what I have read online) is that the dyes and certain ingredients used in certain shades can stain some people’s skin or lead to reactions where skin is more sensitive. I have used these shades on my eyes and not had any adverse reactions in terms of sensitivity, nor have I experienced any staining. However, it is important to note the warning and consider whether your skin may react adversely to the ingredients contained in these products. Please note that I am not a dermatologist or a scientist; you may want to do some research if you are concerned or wish to learn more about the ingredients contained in these shades. 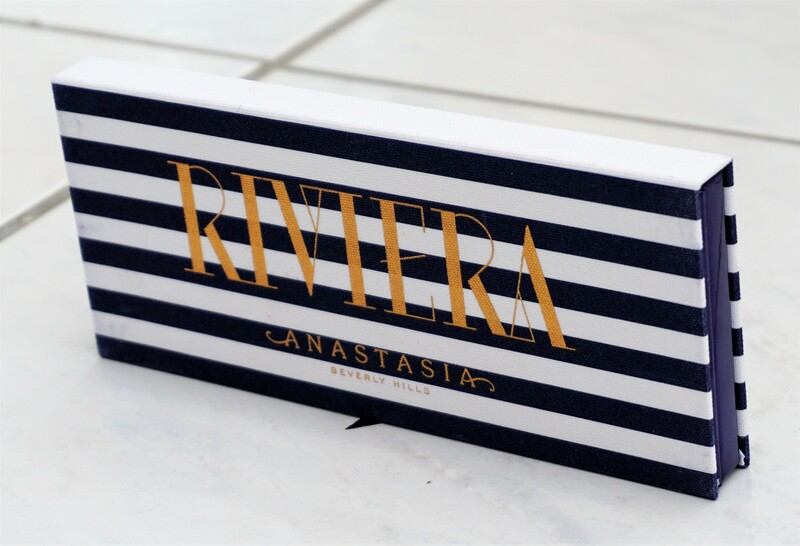 The Riviera Palette comes in a sleek, rectangular white and navy striped box, with chrome-like gold lettering. The front of the palette mimics the outer packaging, with ‘Riviera’ and the brand name printed in chrome-like gold lettering. 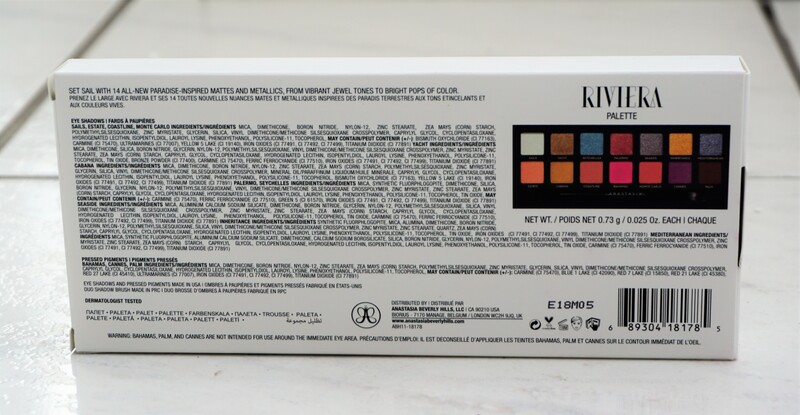 The back of the palette has a sticker providing the distribution information, brand website, where the palette and brush are made (USA) and the product weight. The palette has a canvas-like, textured feel, which is quite different to the velvet finish of other Anastasia palettes, like the Norvina Palette (you can see my post on the Norvina Palette here). The palette feels relatively light-weight, yet sturdy in the hands. The palette opens to show a mirror on the inside of the top lid and the eyeshadows in the bottom section. The mirror is a reasonable size and handy if you don’t have a mirror to hand. The palette contains 14 eyeshadows, with the names printed underneath each eyeshadow. The top row contains the shimmer eyeshadows (including one matte) and the bottom row has all matte eyeshadows. There is also a double ended brush housed in a small, indented section underneath the eyeshadows. One end of the brush is a flat shader brush, whilst the other end is a fluffy, crease/blender brush. There is a handy little ribbon tab in the brush section which you lay the brush on, enabling you to easily pop the brush out of the palette. The tab is a really good feature, as it can sometimes be tricky to get brushes out of palettes from the little indented sections! Whilst I do prefer to use my usual brushes for make-up application, both ends of the brush seem really good. I think it is really handy having the brush in the palette, particularly if you are travelling or you don’t want to have to invest in various eyeshadow brushes. The palette contains an eye-catching range of matte and shimmer shades, including white, bronze, pink, aquamarine, blue, gold, purple, peach, mustard and brown. The shades and names are holiday or nautical inspired, tying in with the nautical concept behind the palette. The blend of shades in the palette enables you to take your looks in all sorts of directions, whether you want to go all out with colour, add little glints of colour or go more neutral. I love playing with colour but I also like having the option to add just little ‘pops’ here and there or to create a softer look. There is a mix of finishes, with a choice of five shimmer and eight mattes, enabling you to use the eyeshadows in all sorts of ways. The different finishes enable you to add depth and pops to the eyes for a more complex look, or simply add a pretty wash of colour to the lids. The various neutral-toned mattes (like Estate, Cabana, Coastline and Palm) act as great transition, crease and lid colours. The shimmery shades are beautiful for single eyeshadow looks or to emphasise the lid when using mattes in the crease. I love that there is a choice of colourful shimmers and mattes in the palette, rather than just a focus on bright shimmers and all neutral mattes. Having colourful mattes encourages me to experiment with different colours in the crease, adding some really fun twists to my looks. Monte Carlo and Bahamas look particularly beautiful in the crease when paired alongside contrasting shimmers on the lid, such as Seychelles, Seaside and Inheritance. I really love that there are also more neutral-toned shimmer and shades in the palette (Sails, Yacht, Estate, Cabana, Coastline, Palm) as these shades enable me to tone down more colourful looks or create more natural eyeshadow combinations. Estate and Coastline are particularly beautiful for adding subtle definition to the crease and are shades I find myself using regularly. Cabana is a really interesting, mustard tone and not a shade I have seen much before in other palettes or ranges. I really like this shade on the lid for a simple matte look with Palm in the crease or in the crease with other shades on the lid. Palm is the darkest shade in the palette and wonderful for adding more depth to looks, either in the crease or outer v of the eye. Palm, along with the other shades, can also be used as an eyeliner, to add some smokiness or colour to any look. The eyeshadows in the palette are beautifully pigmented, buttery soft and a dream to blend. The shimmery eyeshadows (top row) really come alive when they are packed on the lid, so I would highly recommend using a flat shader brush for application. I haven’t needed to use my finger, or had to spritz my brush with a fixing spray/water, to apply the eyeshadow more evenly. The mattes apply beautifully, whether you use a flat shader brush or a crease brush for application. One thing worth mentioning is that the eyeshadows are quite soft in texture; they are a lot softer than other eyeshadows I have used before. The matte and shimmer shades can also kick up quite a bit of extra powder when you dip your brush in to them. I think the soft texture helps make the powders extremely blendable and easy to use. However, it means that you do need to be careful about not applying too much pressure when you use your brush and to tap off any excess powder before application to prevent excessive fallout on your face. The Anastasia Beverly Hills Riviera Palette costs £46 and is available in the UK from Cult Beauty, Feel Unique, Beauty Bay, Selfridges and Anastasia Beverley Hills. Do you have the Riviera Palette? What do you think of it? Any shades that are your favourites or any combinations that you love? Let me know in the comments section below.